Since its inception, SurveyLA has racked up an impressive list of accomplishments. Community workshops were held all across the City to educate the public about the project and tap into valuable grass roots knowledge of historic places. A historic context statement has been developed and is being continuously fleshed out and refined. Survey findings for 12 community plan areas have been released, each of which represents a mammoth effort typically encompassing tens of thousands of parcels. A social media program has been put in place to engage the public and demonstrate that historic preservation is not just about professionals examining properties in the field or studying dusty esoteric documents, but also a collaborative effort that is strengthened by an engaged public. Perhaps just as exciting is what SurveyLA has ahead of it. We can look forward to working with the Getty Conservation Institute to develop a customized open-source Geographic Information System based on Arches that will bring together an unprecedented amount of Los Angeles’ historic resources information on the web in a searchable, mappable format. We can look forward to SurveyLA findings in 23 more community plan areas. We can look forward to many community plan updates that incorporate a level of historic resources information that was never before available. We can look forward to a City that is more aware of its heritage than ever. Another exciting change on the horizon is a new Social Media Coordinator for SurveyLA (who I have every confidence will do an excellent job). As I step into new professional responsibilities elsewhere, I look back on my time with SurveyLA with a tremendous sense of pride and gratitude for the chance to have participated in such an amazing project working alongside many wonderful people at the Office of Historic Resources, Historic Resources Group and all of SurveyLA’s consultant teams. I would also like to thank everyone who has contributed posts to this blog (read to the beginning! ), everyone who ever left a comment, submitted a historic place suggestion or attended one of our workshops. Since there will be a changing of the guard, this is an excellent time to leave a comment giving your feedback on our social media program. What are we doing well? What could we do better? Is there a new platform we should be taking advantage of? 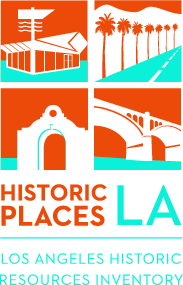 Of course we ALWAYS love to hear your historic place suggestions over at MyHistoricLA.org. There’s a lot more historic resources survey work to do and it’s a team effort!